On 23rd March 2009, the commuters in Belgium’s Grand Central metro station suddenly got to hear Julie Andrews “Do Re Mi” on the announcement system. Soon it broke out into something they will remember for their lives. A musical prank played by VTM – a 200 strong flash mob dance stunt to announce their newest reality television program “Op zoek naar Maria”. The idea was to search for an actress who would play the leading role in the The Sound of Music. See the video below to know what happen. Be prepared to be enthralled. Earlier this year in January, T-Mobile in the UK launched an advertising campaign that had a similar flash mob dancing in London’s Liverpool Street Station. 350 dancers made the day for commuters passing through the railway station. That was an advertising campaign aired on TV later in the same month. I am not anyone’s idea of a good dancer, but there is something about well choreographed dances that just make you feel GOOD. Real good. On a related note, it’s not news to anyone that I absolutely love pranks. I love pranks made on public like the above few examples – not the ones that are for slapstick fun though. I am talking of those that deliver a tiny message – take a deep breath, and appreciate what’s around you. A while ago, I wrote about Prangstgrup, a group based in Columbia University that did simply amazing things – a musical in the middle of a lecture, in a library, teaching architecture to absolute strangers in the metro – 17 masterpieces since I checked! Why on earth is this NEWS? How necessary. President bumps his head. So had Bush, apparently, towards the start of his presidency. Turns out there is a video too. How is this relevant to anything at all? I know he is living the life of a goldfish in a fishbowl, completely in the eyes of the country. But bumping his head? Come on! It could be a part of The Daily Show or Late Night or even Saturday Night Live – but not CNN main news! Next we would know about when his dog poops and whether the secret service cleans up after the first dog. So Google is out with Google Earth 5.0. What’s new? Diving under the ocean, historic imagery, and recording tours. Dive under the ocean? Yes, dive under the ocean. What’s historic imagery? Well, you can surf a landscape and click the tiny clock that appears on the toolbar, and can see how that landscape has changed with time. Wow. Here’s the video from Google. Chess boxing. No, really, it’s a legit game! And has been around for 6 years now. Officially, i.e. There is a federation and all, with sponsors too! 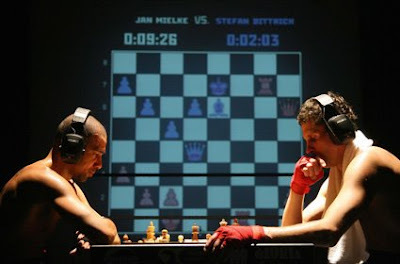 Originally a figment of the imagination of French comic book creator Enki Bilal, chess boxing was probably intended to show that boxers can think. Or may be to show that chess players can fight. artist Iepe Rubingh decided to turn fiction to reality when he officially started this game. Twelve alternating rounds of 4 minute chess sessions and 2 minute boxing sessions. Winner defeats by knockout or checkmate. I guess punching during the chess game is not allowed. Also in the list of crazy sports are included Wife Carrying and Cheese Chasing. Yes, they are exactly what they sound like. Considering it started in 2003 and now it is the end of 2008, that is 6 years. Now let us look at the daily expenditure. We have (had?) a bailout plan costing $700 billion. The auto giants require a $14 billion bailout. Considering daily cost of the Iraq war, it turns out that it would take US just 50 days to equal the cost of the auto bailout. Also, did you notice that the cost of the Iraq war is almost equal to the cost of the economic bailout of $700 billion? So this happened earlier today… when US President Bush made an unannounced visit to Iraq, and a reporter threw shoes at him calling him a dog. While Bush ducked well in both shots, I feel a little bad for him.